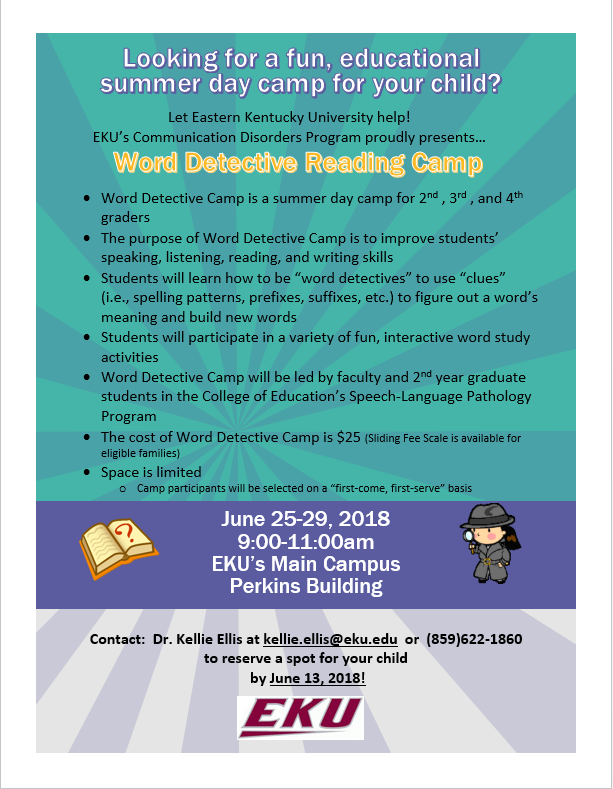 Word Detective Camp for 2nd, 3rd, and 4th grade students will be held June 25-29th, 2018 from 9-11am, at the Perkins Conference Center on the EKU Richmond Campus. The purpose of Word Detective Camp is to improve students’ speaking, listening, reading and writing skills. Camp participants will complete a variety of fun, interactive word study activities as they learned how to use “clues” (i.e., spelling patterns, prefixes, suffixes, etc.) to figure out a word’s meaning and build new words. 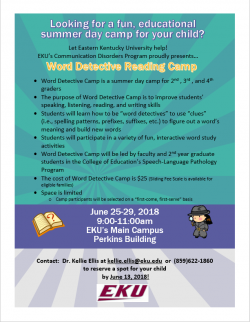 Word Detective Camp is led by 2nd year graduate students under the direction of Dr. Kellie Ellis. For more information, please contact Dr. Ellis at kellie.ellis@eku.edu or call 859-622-1860. Registration is $25 with a sliding scale available for those that qualify.